If you are injured during work in New Jersey, you are entitled to a number of different medical benefits for different stages of your injuries. Under New Jersey law, an injured worker can receive workers’ compensation for injuries regardless of who was at fault in the incident. However, these benefits prevent the worker from being able to bring a civil suit against the employer, except in the case of intentional acts, so it is often best to consult a worker’s compensation lawyer before moving forward. This includes compensation for all necessary and reasonable medical treatment, hospitalization services, and prescriptions related to the work injury. The employer has the right to designate the physician for work-related injuries, so notify your employer as soon as possible if you have concerns about the physician chosen. These benefits are provided when an injured worker is under active medical care and unable to work for more than one week. New Jersey workers are entitled to temporary total benefits at 70 percent of their average weekly wage (but not more than 75 percent or less than 20 percent of the Statewide Average Weekly Wage). These benefits typically end when the worker is authorized to return to work in some capacity or has reached the “maximum medical improvement”—that is, any additional medical treatment would not improve the condition of the injured worker. If left with partial permanent injuries or total permanent injuries, the worker is entitled to other types of benefits. If a work-related injury causes a partial permanent disability, workers are entitled to compensation for “scheduled” and “non-scheduled” impairments. “Scheduled” losses deal with the arms, hands, fingers, feet, legs, toes, eyes, ears, and teeth. “Non-scheduled” losses, however, deal with any areas of the body not specifically mentioned in the scheduled losses, such as the back, lungs, or heart. Once temporary disability ends and the permanent disability remains, these payments are due to the injured worker. A full schedule of disabilities and maximum benefits thereof are available here. Injured workers are eligible for permanent total disability benefits if the injury prevents the worker from returning to any kind of gainful employment. The benefits are provided for a period of 450 weeks, after which the injured worker will have to show he or she is still unable to earn wages to continue receiving benefits. Permanent total benefits are paid weekly and are based on 70 percent of the average weekly wage, not to exceed 75 percent of the Statewide Average Weekly Wage or fall below 20 percent of the Statewide Average Weekly Wage. Permanent total disability is presumed when the injured worker has lost two major members or a combination of members, including eyes, arms, hands, legs, or feet. But any combination of injuries that render the worker unemployable could be grounds for permanent total benefits. For workers with pre-existing disabilities, a new injury can be devastating to employability. The Second Injury Fund was established to make payments to injured workers who are permanently disabled as a result of a work-related injuries combined with a pre-existing condition. If a worker dies due to a work-related injury or illness, his or her dependents could be eligible for death benefits. The benefits, paid weekly, amount to 70 percent of the deceased worker’s weekly wage (not to exceed the maximum benefit amount established by the Commissioner of Labor). A hearing will be held to determine the extent of dependency, after which the benefit amount is divided among surviving dependents. Spouses and children who lived in the worker’s household at the time of death are presumed dependents, but all other alleged dependents (including parents, grandparents, brothers, and sisters) must prove actual dependency. Dependents are also eligible to receive up to $3,500 in funeral expenses for a work-related death. 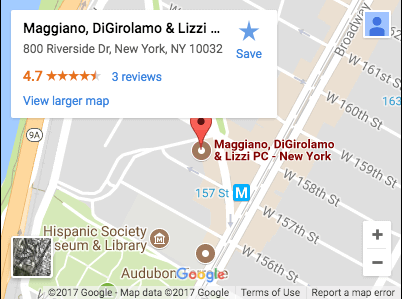 For more information about workers’ compensation and potential benefits, contact Maggiano, DiGirolamo & Lizzi for a free, confidential consultation.